I will never forget the first time we had to leave the house with my oldest daughter after we brought her home from the hospital. Scott and I were taking her to her first doctor appointment and the office liked to see newborns first thing in the morning. We were running SO late and were about to leave the house when it dawned on us... we needed to bring the diaper bag with and we had no idea what we actually needed to put in it, expect for diapers of course. I'm pretty sure we ended up bringing half the house with us, just in case she needed five changes of clothes, four blanket options and every toy she owned, since 3 day old babies typically need a toy to play with!? Well, fast forward five years and two more babies, I've learned a thing or two about what you actually need in your diaper bag and what can stay at home. Here is everything that I carry around with me on a daily basis, I'll break down what I keep in each compartment and why that item made the cut! 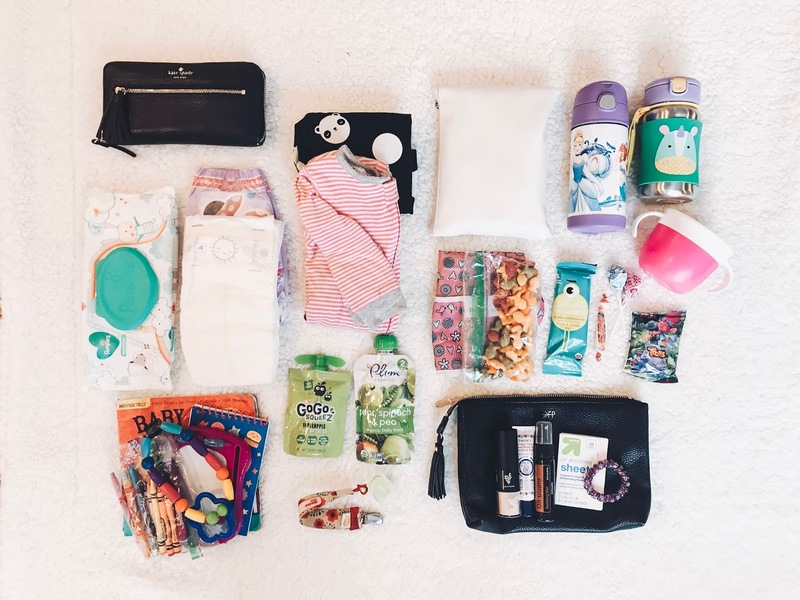 Yep, you can fit ALL of this in the Freshly Picked diaper bag AND still have some room to spare! My Mom gave me the Freshly Picked diaper bag as a Christmas present right before my third daughter was born, it is definitely an investment, but has held up perfectly over the past year! I love that it is leather, which means it's easy to wipe down and I chose the ebony color because I knew Scott would be carrying it around too. I also love that the inside lining is waterproof, which also means it's easy to wipe down. So yes, my first tip, make sure you get a diaper bag that you can wipe down, TRUST me, spills are going to happen. * Tip: Buy a backpack diaper bag, hands free is the way to go! I had a crossbody diaper bag with my oldest and the second my middle daughter was born, I ordered a backpack. The last thing you want is a diaper bag getting in your way when you are out and about, my diaper bag also has hooks that you can attach to your stroller, another one of my favorite features. 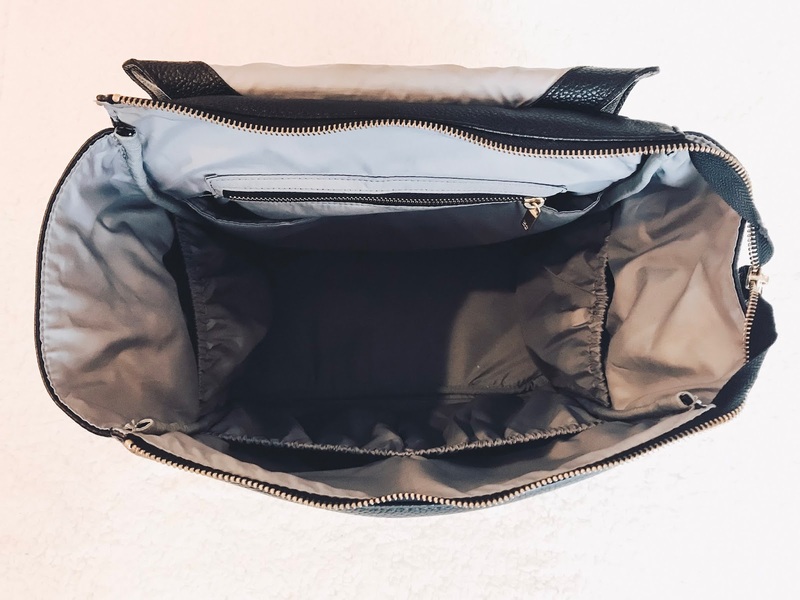 Here is a picture of the inside of the diaper bag, this is a photo I just took, my diaper bag is over a year old, I use it every single day and the inside still looks perfect! There are a ton of pockets, as well as an inner/outer zipper pocket and the diaper bag also comes with a matching changing pad. This is what the inside looks like with everything inside, as you can see, I have room to spare. I try not to over stuff my bag because I also want it to be as light weight as possible. I always like to carry hand sanitizer, lip balm, loose powder, oil sheets and a hair tie with me at all times, this is also where I keep my gum and snack for myself, because nothing is worse then running errands when you're hangry. 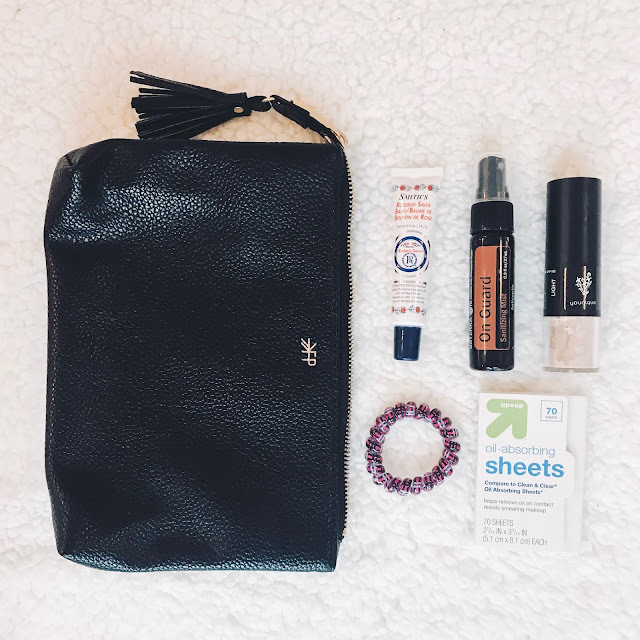 * Tip: Freshly Picked also offers a clutch, which is great for storing personal items that you would want to take out and put in a purse if you were going somewhere without a diaper bag. Storing these items in a clutch like this is great because you don't have to pack and un-pack every time you switch your bag and if you're like me, I would probably end up forgetting something if I didn't keep everything together, #mombrain. Next up, the most important component... diapers, wipes and a pull-up for my middle daughter who is 99% potty trained. I use to keep a weeks worth of diapers in my diaper bag, which made it super bulky! If I know I'm only going to be gone for a short time, I carry around fewer diapers, if it's a longer day trip, I obviously pack extra. 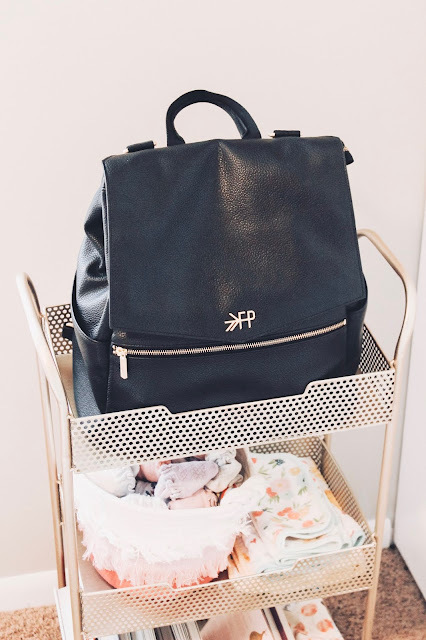 * Tip: When it comes to packing extra clothes, opt for a one piece sleeper, that way you don't have to fold multiple pieces of clothing, again making the diaper bag bulkier. I also pack a pair of extra leggings for my middle daughter, she is just starting to wear undies when we are out in public, so this is a must if you are currently potty training. 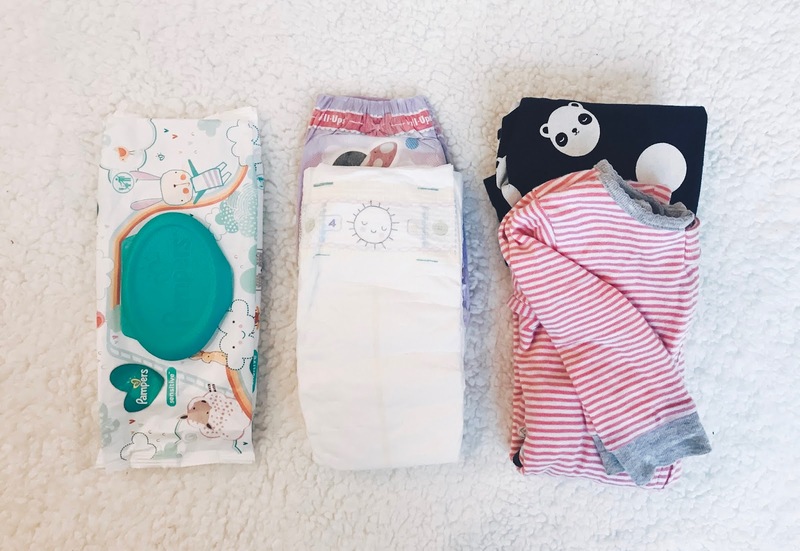 * Extra Tip: Stuff a plastic grocery bag in the bottom of your diaper bag with the extra clothes and use it when you need to store dirty clothes! Another critical part of the diaper bag #snacks and I really hope all the Mama's are shaking their heads saying "yes!" right now! 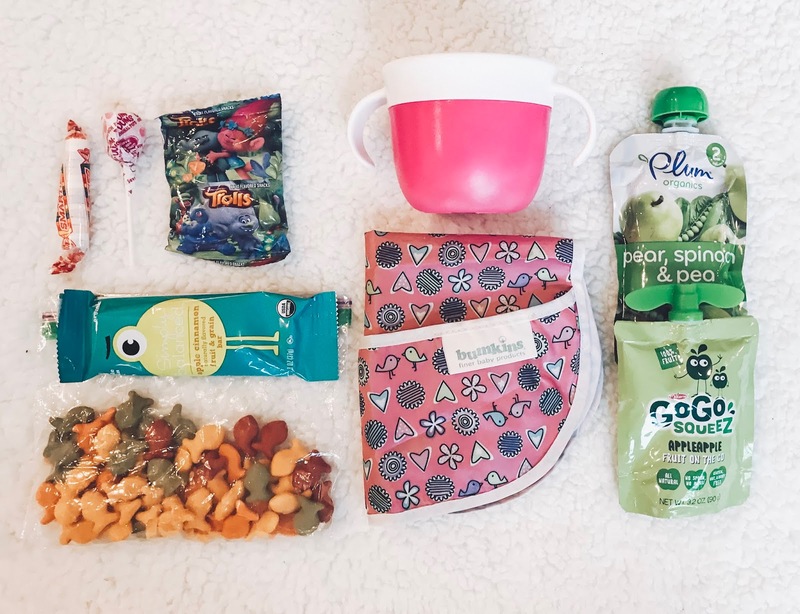 You can't forget to keep snacks stocked up in your diaper bag, I like to keep goldfish, granola bars and apple sauce pouches for my older girls and always keep a bib along with a pouch/Puffs in the bag for my youngest. If I know we will be gone for an extended period of time, I'll also throw in a bottle (we use Dr. Brown bottles), which fits perfect in the inside side pocket or the large outside side pockets too. My older girls' water bottles fit just right in the side pockets and instead of carrying an additional water for myself, I just sneak drinks from theirs and keep my large water bottle in the car! Anything to keep my bag light weight, did I mention that already!? * Tip: Keep an emergency stash of "treats" for emergency situations, such as, a long line at the grocery store, a long wait at the doctor's office, or just a case of the Monday's ;) My girls love "gummies" (fruit snacks), suckers and Smarties, all of these items are small, easy to carry around and won't melt! My middle daughter has some food allergies, so I have to carry around her prescription and Benadryl with me at all times! 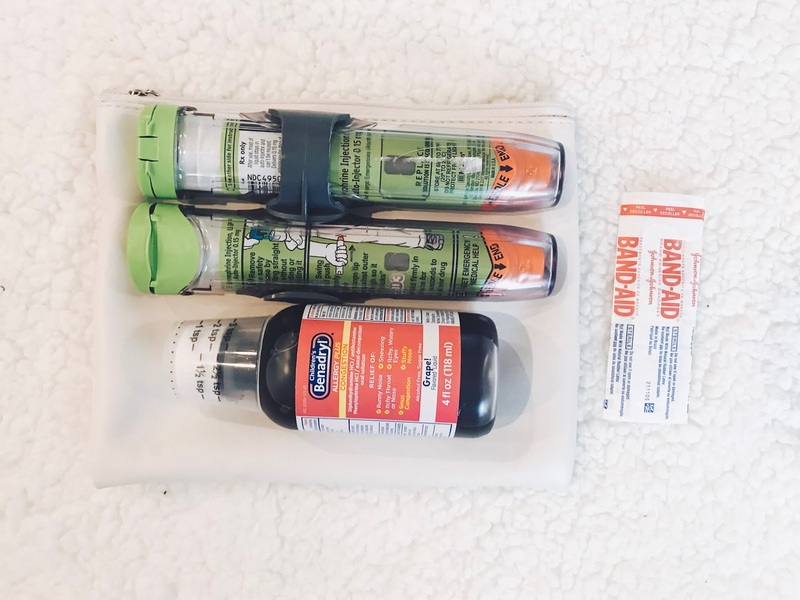 I use this little pouch as a "First Aid" kit and usually have Band-Aids and occasionally will carry Tylenol/Motrin if needed. I always keep a few small toys in my diaper bag to keep the girls occupied during a long wait, long line, or just to help power through a morning of errands! Isla loves the Indestructible books and is majorly teething right now, so I always have a teether on hand. 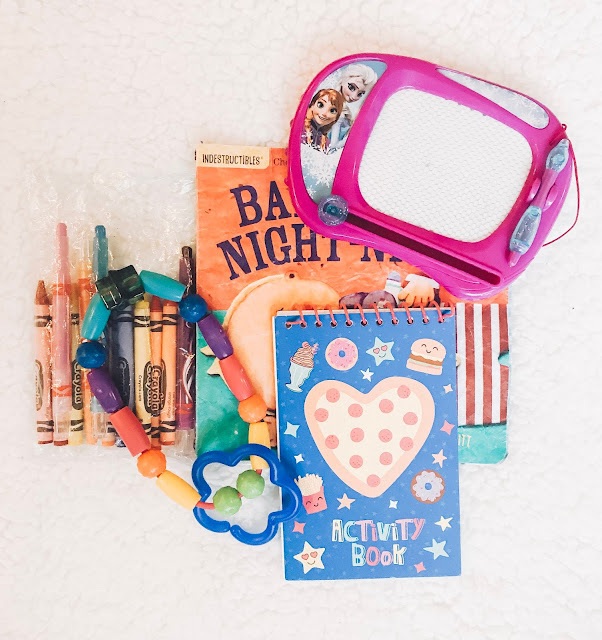 * Tip: My older girls love coloring in small notebooks or drawing on the mini magnetic drawing board, I found most of those items in the Target dollar section and have a small stock pile at home, ready to restock when needed! I have also carried around a small container of play dough with a small cookie cutter for the girls to play with if we are going to be out at a restaurant. 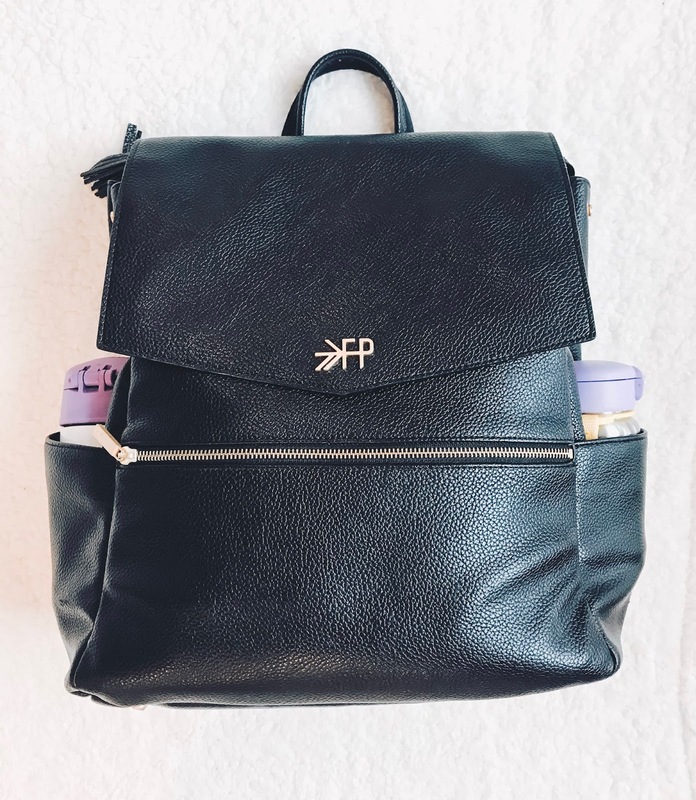 Thanks for taking a peek inside my diaper bag! I try to keep things minimal, it makes it easier to keep my diaper bag organized, allows me to find the things I NEED quickly and keeps my bag light weight. * Tip: If we are taking a long day trip, for example, going to the zoo, I pack an extra insulated bag with all of our food, water bottles, etc., I won't be needing those items consistently throughout the day, so I try to keep that separate and usually store it on the bottom of my stroller. * Extra Tip: Always pack your diaper bag the night before a big adventure! More then likely, things can get a little chaotic in the morning and every time I try to pack my bag right before we go somewhere, I end up forgetting something. This tip comes in extra handy once you have more then one little one coming along with you on your adventures! 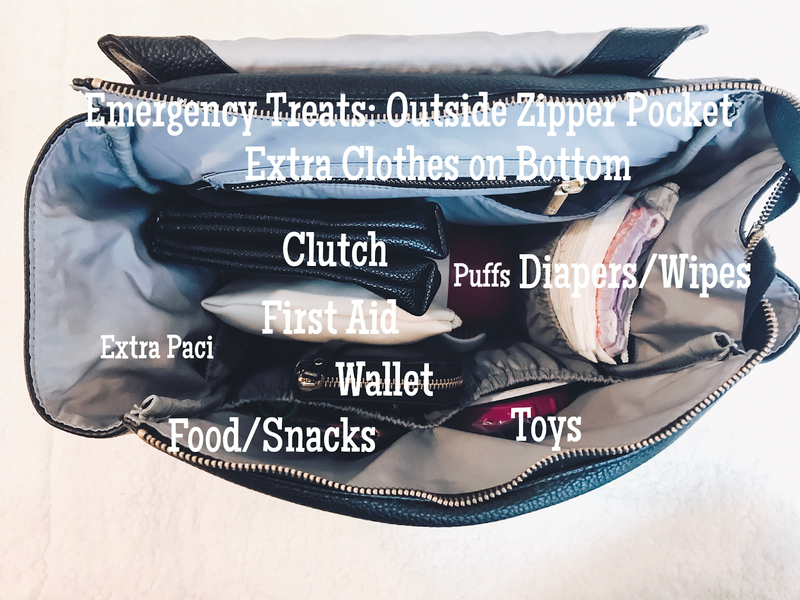 Mamas, please share any of your must have diaper bag items in my comments, I would love to hear how you keep things simple in your bag too! Congratulations!! It's crazy how much you have to pack, especially for a newborn, I hope this helped simplify the process a bit for you! When are you due! ?